Chronic illness is probably difficult at any age but at 27 years old I refused to live the rest of my life in that kind of pain. After trying many different treatments including a pretty scary mishap with a neurostimulator I was looking for something more holistic that could help and was referred to Eugene and Lucy at the cryosauna. Nothing has helped more in the last 3 years since I was diagnosed with Fibromyalgia more than the Cryo Sauna and Shiatsu at the Cryo Spa. Eugene, Lucy and everyone at there are truly amazing. Cryosauna has been a very positive health experience for me. For the last two years I spent lots of time and money with doctors. No one has been able to help me with my skin condition. After 15 Cryo Spa treatments my skin has improved remarkably!! Thank you so much Cryosauna my skin condition is clearing up! I have also experienced several additional health benefits from my Cryo Sauna treatment, my allergy and asthma, my moods have improved and I sleep through the night and my overall will being has improved! An extra bonus is that I have been also losing weight! Let me begin by telling you that I do not tolerate cold! I was certain that these procedures are not for me. I was looking for other ways to relieve my arthritis pain, but did not have much luck. Finally I decided to give it a try. To my surprise it was not bad at all! So far, I took 12 procedures. After about 15 procedure arthritis pain in my left hip was gone! My insomnia was gone!! And so is my chronicle fatigue!! I feel 20 years younger!! 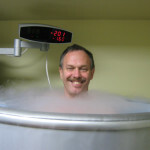 I initially sought out full body cryo therapy to help treat an auto-immune condition I have I have which causes the inflammation of major muscle groups and great pain and immobility. I was being treated for over a year with steroids, but every time I tried to wean off them the condition would flare right back up. After my very first cryo spa treatment I saw great results. I was much more mobile, the pain was nearly gone and I was no longer waking multiple times at night with extreme leg cramps. I have continued sessions and have gotten better each time. Though there have been a couple flare ups, they have been of a much shorter duration that before; a day instead of weeks! I am no longer on steroids or any anti-inflammatory medicine. I can run up and down steps like I haven’t In years! I have also seen a decrease in my glucose levels and had to reduce that medication to half in only 8 sessions. I have also noticed a shrinking of my varicose veins and a lightening in some dark scarring I had on my legs from slight scratches, which had gotten dark and very unattractive. I am working with my physicians to ensure that I reduce any other medications properly, and expect that I may need less and less as I continue treatments. I could not be more thrilled with all the results, expected and unexpected!. Thank you for being in our area! Cryogenic sauna is the best procedure I have received ever throughout my wellness journey. 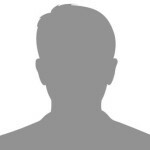 Due to several surgeries, I gained about 60 pounds and was not able to lose them easily. I found out about this treatment and thought that I would give it a try. I figured, I have tried so many other treatments and diets and by trying one more thing I did not have anything to lose. At first, I was intimidated due to the knowledge that it would be cold. However, it was all worth it. Cryogenic sauna gave my metabolism a boost like I had never experienced. I felt energized and the joint pain I had felt was gone after just three sessions. I have lost weight and continue to lose weight. I have been a type 1 Diabetic for 15 years and a poorly controlled one at best. Over the years I have seen countless physicians and specialists, yet my health has steadily declined. That is until I found Cryo Spa. This little gem and Eugene are literally saving my life. I have only had six treatments so far and the results are outstanding. I have improved circulation, blunted chronic pain in my feet, improved sleep, and fringe benefit weight loss!!! This is just the beginning, the sky is the limit, stay tuned! 30 sessions later I have experienced positive health changes that I never thought possible. My blood sugar control is at an unprecedented, and the numbers and amount of medication I need continues to drop! I sleep like a rock, have more energy than I’ve had in a decade, and am regaining my life. I am and will be forever grateful for these gifts. I anticipate even bigger and better changes in the future. When I tried Cryo-Sauna I felt rejuvenated after only three minutes. It felt exciting like after ice skating or skiing when you are freezing outside and then you go inside, you have an afterglow. I noticed that my food cravings diminished and my blood sugars lowered helping to control my diabetes. My skin felt smoother. My appetite was less and I lost a few pounds. The joints in my hands and feet moved with ease. My body craved the new sensations, I felt alive. Give it a try. I came here in hopes to find natural relieve from my back pain and pain in my knees. After just 15 procedures pain in my back and knees not just subsided but completely disappeared. The results are amazing considering that I completely stopped taking medications. I am very happy with the results. I feel great, and I lost 6lb. After 2 weeks of treatments my knee pain is much improved. I am to the point I may start running again! In and out appointments. Service is great and staff very accommodating. Way to go Eugene! I am a former gymnast. I have suffered from back pain most of my life. I tried different types of treatments, and all possible medications, but nothing would bring relief for long. Luckily, I discovered cryo! It brought me back to life and gave me hope! After the very first procedure I started to feel better, and after 5 – I was pain free!! It looked promising but I was skeptical. After all, nothing I tried before worked, but I kept going, I had nothing to lose but a lot to gain if it would really work. I have noticed that for the first time in a long time I had undisturbed sleep, because I was not waking up from every painful movement. After 20 procedures the arthritis pain in my hips is gone completely, my mood is elevated and I feel 20 years younger! I am no longer taking any pills and feel great! Cryo gave me a new life!!! I feel great since I just finished my Cryo Therapy session. Each session is significant in helping me return to normal walking as I am fighting RA (Rheumatoid Arthritis). Thank you Eugene! 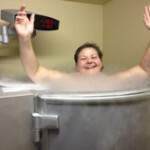 – the owner of Cryo Sauna in Southampton PA – you are an inspiration to me in conquering my RA. I had pain in my knees for about 24 years by now. Pain was constant and to the extent that I was not able to bend my knees at all. Couple years ago I started having pain in my shoulders and developed frozen shoulders. When I saw advertisement for Cryo sauna treatments I decided to give it a try. I am very excited to share that after the 3rd treatment pain in my joints is gone and it feels only like a slight discomfort. My shoulders move with ease!! And I can bend my knees!! It brings forgotten feeling of freedom of movement to the joints! Thank you Cryo Spa Natural Healing Center! This is truly amazing!!! All my stress was completely gone after the very first session! I really did not think it is possible. But when I was driving home after the session I realized that all the heavy load of stress and worries malted away and I feel refreshed and ready to face whatever challenges there are in the store for me!! Another GREAT and unexpected thing that happened during these treatments is that my “seasonal” (in reality a whole year round) allergies cleared out. I stopped using my all my allergy sprays and pills!!!!! WOW!!! I feel great!! My immune system is stronger than ever now!!! For the first time, I did not get sick ones this winter!! I highly recommend the Cryo Spa in Bucks County. I have been going for the cryosauna and shiatsu massage and am enjoying the results.Eugene, Gail and the staff are terrific and work around my schedule. Thank goodness for Cryo Spa! Thank you Cryo Spa and Eugene! For the first time in over two years I am without pain. I am able to move my neck. I feel more hopeful for the future. The inflammation in my wrist gone, and without the major medications that I have tried in the past. Sincerely, Rheumatoid Survivor. Amazing is the only word I can think of. It has helped tremendously with my knee pain and range of motion. I would highly recommend it for anyone who feels defeated and overwhelmed with pain they have been told can only be fixed with major surgery or who think they are stuck with their arthritis pain without any options.I walk and feel so much better. I noticed it after the first procedure, although I am sure it varies by individual. I have been getting Cryo treatment for the past couple of months. I have received quite a bit of relief from my fibromyalgia and arthritis pain in my arms, legs and lower back. Having a massage after the treatments really helps. Eugene and the rest of the staff are great. I would recommend anyone who is in pain and have not found anything to relieve it to give Cryo and massages a try. My doctor has been quite happy with my progress since going for Cryo. I have suffered from fibromyalgia since I was 16. The results I have gotten from shiatsu massage and cryotherapy have been life-enhancing. I routinely drive about an hour to appointments and always feel better in the weeks and months following a therapy. The spa’s environment is welcoming, warm, and peaceful. Since it is brand new, everything is state-of-the art and designed to enhance your visit. You will not be disappointed.